"Daimio" redirects here. For the skipper butterfly genus, see Daimio (butterfly). The daimyō (大名, Japanese pronunciation: [daimʲoː] ( listen)) were powerful Japanese feudal lords who, until their decline in the early Meiji period, ruled most of Japan from their vast, hereditary land holdings. In the term, dai (大) means "large", and myō stands for myōden (名田), meaning private land. Subordinate to the shōgun, and nominally to the Emperor and the kuge, daimyō were powerful feudal rulers from the 10th century to the middle 19th century in Japan. From the Shugo of the Muromachi period through the Sengoku to the daimyō of the Edo period, the rank had a long and varied history. The backgrounds of daimyō also varied considerably; while some daimyō clans, notably the Mōri, Shimazu and Hosokawa, were cadet branches of the Imperial family or were descended from the kuge, other daimyō were promoted from the ranks of the samurai, notably during the Edo period. The term daimyō also sometimes refers to the leading figures of such clans, also called "Lord". It was usually, though not exclusively, from these warlords that a shōgun arose or a regent was chosen. Daimyō often hired samurai to guard their land and they paid the samurai in land or food as relatively few could afford to pay samurai in money. The daimyō era ended soon after the Meiji Restoration with the adoption of the prefecture system in 1871. The shugo daimyō (守護大名) were the first group of men to hold the title daimyō. They arose from among the shugo during the Muromachi period. The shugo-daimyō held not only military and police powers, but also economic power within a province. They accumulated these powers throughout the first decades of the Muromachi period. Major shugo-daimyō came from the Shiba, Hatakeyama, and Hosokawa clans, as well as the tozama clans of Yamana, Ōuchi, and Akamatsu. The greatest ruled multiple provinces. The Ashikaga shogunate required the shugo-daimyō to reside in Kyoto, so they appointed relatives or retainers, called shugodai, to represent them in their home provinces. Eventually some of these in turn came to reside in Kyoto, appointing deputies in the provinces. The Ōnin War was a major uprising in which shugo-daimyō fought each other. During this and other wars of the time, kuni ikki, or provincial uprisings, took place as locally powerful warriors sought independence from the shugo-daimyō. The deputies of the shugo-daimyō, living in the provinces, seized the opportunity to strengthen their position. At the end of the fifteenth century, those shugo-daimyō who succeeded remained in power. Those who had failed to exert control over their deputies fell from power and were replaced by a new class, the sengoku-daimyō, who arose from the ranks of the shugodai and ji-samurai. Among the sengoku daimyō (戦国大名) were many who had been shugo-daimyō, such as the Satake, Imagawa, Takeda, Toki, Rokkaku, Ōuchi, and Shimazu. New to the ranks of the daimyō were the Asakura, Amago, Nagao, Miyoshi, Chōsokabe, Jimbō, Hatano, Oda, and Matsunaga. These came from the ranks of the shugodai and their deputies. Additional sengoku-daimyō such as the Mōri, Tamura, and Ryūzōji arose from the ji-samurai. The lower officials of the shogunate and rōnin (Late Hōjō, Saitō), provincial officials (Kitabatake), and kuge (Tosa Ichijō) also gave rise to sengoku-daimyō. The Battle of Sekigahara in the year 1600 marked the beginning of the Edo period. Shōgun Tokugawa Ieyasu then reorganized roughly 200 daimyō and their territories into han, which were assessed by rice production. Those heading han assessed at 10,000 koku (50,000 bushels) or more were considered daimyō. Ieyasu also categorized the daimyō according to their relation to the ruling Tokugawa family: the shinpan were related to the Tokugawa; the fudai had been vassals of the Tokugawa or allies in battle; and the tozama had not allied with the Tokugawa before the battle (did not necessarily fight against the Tokugawa). The shinpan were collaterals of Ieyasu, such as the Matsudaira, or descendants of Ieyasu other than in the main line of succession. 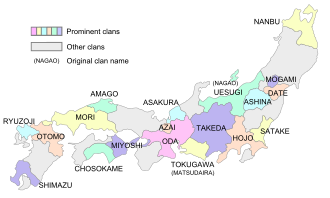 Several shinpan, including the Tokugawa of Owari (Nagoya), Kii (Wakayama), and Mito, as well as the Matsudaira of Fukui and Aizu, held large han. A few fudai daimyō, such as the Ii of Hikone, held large han, but many were small. The shogunate placed many fudai at strategic locations to guard the trade routes and the approaches to Edo. Also, many fudai daimyō took positions in the Edo shogunate, some rising to the position of rōjū. The fact that fudai daimyō could hold government positions while tozama in general, could not was a main difference between the two. Tozama daimyō held mostly large fiefs far away from the capital, with e.g. the Kaga han of Ishikawa Prefecture, headed by the Maeda clan, assessed at 1,000,000 koku. Other famous tozama clans included the Mori of Chōshū, the Shimazu of Satsuma, the Date of Sendai, the Uesugi of Yonezawa, and the Hachisuka of Awa. Initially, the Tokugawa regarded them as potentially rebellious, but for most of the Edo period, marriages between the Tokugawa and the tozama, as well as control policies such as sankin-kōtai, resulted in peaceful relations. Daimyō were required to maintain residences in Edo as well as their fiefs, and to move periodically between Edo and their fiefs, typically spending alternate years in each place, in a practice called sankin-kōtai. In 1869, the year after the Meiji Restoration, the daimyō, together with the kuge, formed a new aristocracy, the kazoku. In 1871, the han were abolished and prefectures were established, thus effectively ending the daimyō era in Japan. In the wake of this change, many daimyō remained in control of their lands, being appointed as prefectural governors; however, they were soon relieved of this duty and called en masse to Tokyo, thereby cutting off any independent base of power from which to potentially rebel. Despite this, members of former daimyō families remained prominent in government and society, and in some cases continue to remain prominent to the present day. For example, Morihiro Hosokawa, the former prime minister, is a descendant of the daimyō of Kumamoto. ^ Katsuro, Hara (2009). An Introduction to the History of Japan. BiblioBazaar, LLC. p. 291. ISBN 1-110-78785-5. ^ Kodansha Encyclopedia of Japan, entry for "daimyō"
Samurai, Chōnin and the Bakufu: Between Cultures of Frivolity and Frugality. This page is based on the Wikipedia article Daimyō; it is used under the Creative Commons Attribution-ShareAlike 3.0 Unported License (CC-BY-SA). You may redistribute it, verbatim or modified, providing that you comply with the terms of the CC-BY-SA.